Phuket (Thailand) – September 25, 2018 (travelindex) – Anantara Mai Khao Phuket Villas is thrilled to be hosting Thailand’s very own Chef Nawamin Pinpathomrat for two nights of private dining and one cooking class in October. 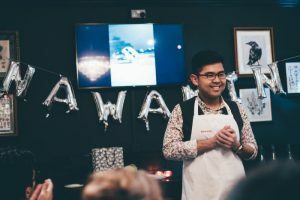 Chef Nawamin gained international celebrity when he became a finalist in the 2018 season of MasterChef UK with his uniquely Thai dishes. A qualified medical doctor studying and conducting research at Oxford, it was Nawamin’s passion for cooking that brought him to the MasterChef kitchen. His “crab dance” caught everyone’s eye, but his crab curry enthralled the judge’s taste buds. Chef Nawamin now brings his delightful take on Thai flavours to Anantara Mai Khao. Anantara Mai Khao’s La Sala, featuring southern Thai cuisine, is the perfect venue to showcase Chef Nawamin’s specialities born from his experiences cooking with his grandmother in southern Thailand. On Friday, 19 October, and Saturday, 20 October, guests can savour a five-course private dinner meticulously crafted by Chef Nawamin. Diners will discover the flavours that inspire these whimsical names: Grandma’s Garden (beef carpaccio and burnt aubergine salad), Wedding Ring (pan-seared scallops, oysters, and shimeji mushrooms), Anatomy of Crab (crab prepared four ways), Land of Smiles (Macadamia-encrusted sea bass), Swan Lake (sticky rice with Thai coconut custard). On Saturday 20 October, Chef Nawamin will share tips and techniques as he takes a cooking class through creating two signature dishes. Starting with Kanom Jeap Nok (Bird-shaped dumplings), the class will learn how to make the dish crab in yellow curry. There are only 20 places available for each night’s dinner at THB 7,500++ per person and only 15 places for Saturday’s cooking class at THB 7,500++ per person, so reservations are highly recommended. A luxury stay and exclusive dining experience package available at starting rate THB 17,300+++ per night. – Above rate is subject to 10% service charge, applicable 7% government tax and 1% provincial tax. – The rate quoted is per night per 2 persons, subject to availability, seasonal variations and change without notice. confirmation is in the official hotel currency and will be charged at that rate on check-out. For more information or to reserve your place, call +076 336 100 or email dining.apk@anantara.com. From cosmopolitan cities to desert sands to lush islands, Anantara connects travellers to the indigenous, grounds them in authentic luxury, and hosts them with passionate expertise. The portfolio currently boasts over 35 stunning hotel and properties located in Thailand, the Maldives, Indonesia, Vietnam, China, Cambodia, Sri Lanka, Mozambique, Zambia, the UAE, Qatar, Oman and Portugal, with a pipeline of future properties across Asia, the Indian Ocean, Middle East, Africa and South America. The brand’s premier vacation ownership programme, Anantara Vacation Club, extends the opportunity to own a share in the Anantara experience with a portfolio of 8 luxurious Club Resorts as well as travel privileges at partner resorts and hotels worldwide. Global Hotel Alliance (GHA) is the world’s largest alliance of independent hotel brands, bringing together 35 brands with 550 hotels in 76 countries. GHA uses a shared technology platform to drive incremental revenues and create cost savings for its member brands. GHA’s award-winning loyalty programme, DISCOVERY, provides over 10 million members exclusive opportunities to immerse themselves in local culture wherever they travel. GHA’s hotel brands currently include: Alila, Anantara, Art Series, Atura, AVANI, Corinthia, Doyle, Elewana, Eventhouse, First, GLO, Kempinski, Leela, Lungarno, Marco Polo, Meritage, Meydan, Mokara, Niccolo, NUO, Omni, Outrigger, Pan Pacific, PARKROYAL, QT, Rixos, Rydges, Shaza, Tangram, Thon, Tivoli, Ultratravel Collection and Viceroy.